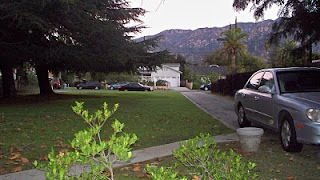 Yesterday morning when I opened my front door to go to work, the air was so crisp and clean, the grass was so green from the rains and the mountain was so beautiful that I quickly took out my camera and snapped a shot. I live in an 1,100-square-foot house on a 10,000-square-foot lot, and the house is set all the way at the back of the property. All of the properties on my block are zoned R-2 (two residential structures per parcel), but mine is a rare one that doesn't have a second house on it. 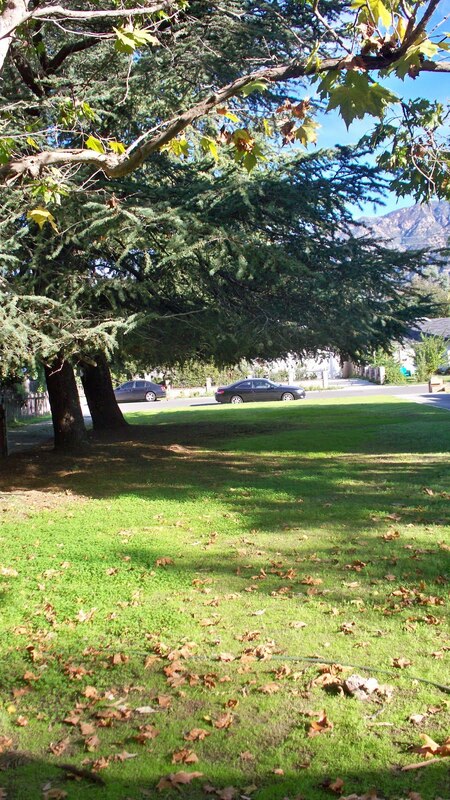 That allows for the park-like yard with the huge sycamore and two Deodar cedars all lined in a row, with the mountain as a backdrop. I don't know when the trees were planted, but they're definitely mature. The house was built in 1922. Over the 20 years I've lived here, some friends and neighbors have pressed me to build a duplex in front of my house as an income property. But then my view would be the back side of a duplex. And the cedars would have to go. I work long hours, and sitting on my front porch every morning to sip tea and enjoy the view is a big part of my quality of life. I water some plants but I almost never water my lawn. It's pretty big, so watering is an expensive proposition. Therefore, thankfully, my water bill from PWP is very low. 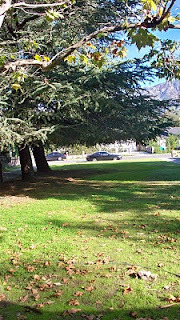 Hey, remember that Pasadena's cool-season lawn and landscape watering schedule kicks in on Monday, Nov. 1. It's a mandatory cutback! More info here. UPDATE: I shot this photo at 7:00 this morning when I was sipping tea on one of the rocking chairs on my front porch. This view, or the back side of a duplex? I'll take this one. Scullery Captain* wins with his/her 12:27 p.m. Tuesday guess "Trash/debris being collected to be burned in the City's Power Plant on Glenarm(?)." 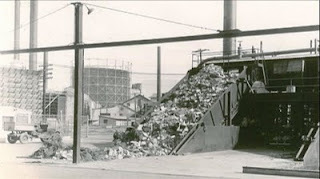 In the photo above, shot in 1933, rubbish is piled up at the new incinerator operated by Pasadena's Municipal Light and Power Department (now called Pasadena Water and Power, or PWP). 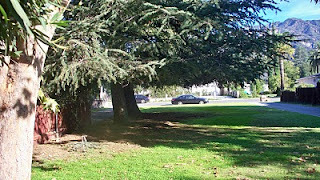 It was one of Pasadena's first attempts at recycling. 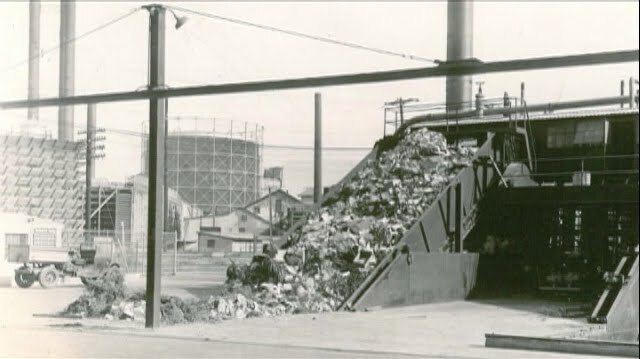 Long before the era of landfills and waste disposal systems, Pasadena faced what a 1930s Municipal Light and Power annual report called a "rubbish condition," with combustible rubbish unpleasantly burned in open pits, causing smoke to drift over the region. At one point the City used an incinerator on Raymond Avenue north of Glenarm Street, but it became obsolete. So, the City turned to Municipal Light and Power to design and construct a rubbish-burning incinerator adjacent to the Glenarm Power Plant. Built by department employees primarily using equipment discarded from the power plant, the incinerator -- designed to handle one hundred tons of rubbish per day in either of its two furnaces -- began operation in November 1933. Besides correcting "a perplexing situation which caused the general city considerable concern," as Municipal Light and Power's 1934-35 annual report noted, the incinerator saved Pasadena taxpayers about $11,000 annually. Department employees developed the incinerator with the plan to convert the disposed-of waste material into steam power for feedwater heating at the Glenarm Power Plant. Though some challenges ensued, it worked. Enough steam was produced to equal one barrel of fuel oil for each three tons of rubbish burned, and the byproduct obtained from the steam during the burning operation was used in the plant. The incinerator continued to operate over the years, and when the City placed a ban on the backyard burning of combustible materials in 1957, the department expanded the incinerator's capacity to 250 tons per day, with some refuse delivered by City employees in a new backyard pickup program. For the department's power plant employees, having the incinerator on-site definitely had its perks. Retiree Herman "Tex" Romine recalled dairy trucks bringing in partially thawed but packaged ice cream that hadn't sold to dump in the incinerator. "Everybody would come over and get all the ice cream they could. We had free ice cream for a week or so," he said, adding that employees with fireplaces also got plenty of firewood; in fact they never ran out of it in winter. But the supply of free ice cream and firewood couldn't last forever. In 1965, Pasadena's Engineering Street Department decided to take rubbish to the Scholl Canyon Disposal Area instead, which reduced the income from the incinerator. The department ceased operating the incinerator on January 1, 1967, and then demolished the equipment to prepare the land for other uses, ending yet another colorful chapter in the department's history. * SC, please e-mail me at aerdman@cityofpasadena.net and I'll tell you about your fabulous prize! A week ago I blogged about a photo opportunity with firefighters in pink shirts. On Monday night, Pasadena City Council members donned pink shirts during their weekly meeting here at City Hall. Vice Mayor Victor Gordo (left) and District 6 Councilman Steve Madison are in the top photo. Below: District 3 Councilman Chris Holden and District 2 Councilwoman Margaret McAustin. Firefighters came in their pink shirts and received a proclamation from Mayor Bogaard for showing solidarity this week with breast cancer awareness and women's cancer research. 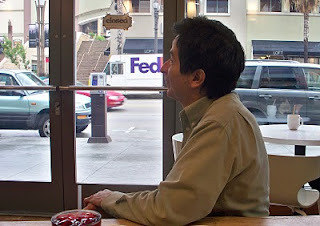 Mike treated me to a belated birthday lunch yesterday at Euro Pane near City Hall. Mike and I know each other because we're local bloggers. Neither one of them wanted to pose for photos, but I snapped them anyway. So there. 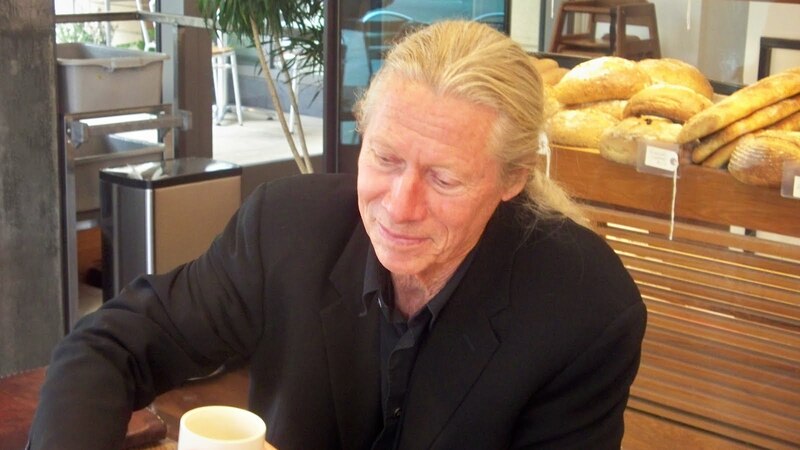 Mike and Bill know each other casually because they both happen to frequent Euro Pane. I had never been there for lunch (only early morning meetings), so I had no idea that I would ever run into Bill there. We haven't seen each other in more than a year. Mike had to leave early, and Bill and I settled in for a catch-up chat, but too soon it was time for me to get back to work. Bill and I have known each other for the better part of 20 years. In addition to having a few great friends in common, we've hung out at the Troubadour, sung duets in Latin by the light of the moon, swapped stories in teepees, and on and on. It's on the wall of my office at Pasadena City Hall. Thank you, Mike! Yesterday was serendipitous to say the least. And the egg salad sandwich was phenomenal. Davis wins with his/her 11:22 a.m. Tuesday guess "Unlike today, when a number of tickets for the annual Rose Bowl game are available to Pasadena residents at the Pasadena Civic Center box office, back in the 50's (by the look of the womens' coats), tickets were sold at the stadium itself. The first day these were available, folks arrived early in the morning for their spot in line. Some brought folding chairs, others made fires to ease the chill. Sound plausible? (I wasn't there.)" Davis, your link didn't go to any contact information, so please e-mail me at aerdman@cityofpasadena.net and I'll tell you about your fabulous prize! 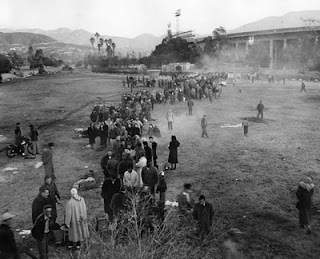 In the photo above, dated Dec. 21, 1951, more than 3,000 Pasadena residents form a line several blocks long in the early morning hours at the Rose Bowl Stadium for an opportunity to purchase 1,750 tickets available to the public. Eleven days later, Illinois and Stanford football teams were on the field at the stadium. Illinois won 40 to 7 (ouch). 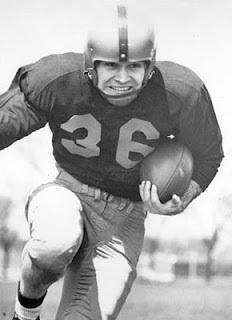 Illinois' Bill Tate (above) was named MVP. This year, public tickets to the 2011 Rose Bowl Game will go on sale at 8 a.m. on Tuesday, Dec. 7, through Ticketmaster only. Many thanks to the Tournament of Roses. On Monday morning, Pasadena firefighters swapped their standard uniform shirts for pink t-shirts to help raise awareness of breast cancer and women's cancer research. As public servants, Pasadena firefighters lead by example in this community every day. In the composite photo above, firefighters from Fire Station 34 pose with representatives from the Susan G. Komen Foundation. We had a photo opportunity for media on Monday; firefighters will wear the pink shirts while on duty from Oct. 25 to 30. Shirts will also be available to the public for $20 at Fire Station 34, 1360 E. Del Mar Blvd. All proceeds will be donated to the Susan G. Komen Foundation. Many thanks to the Pasadena Fire Department. 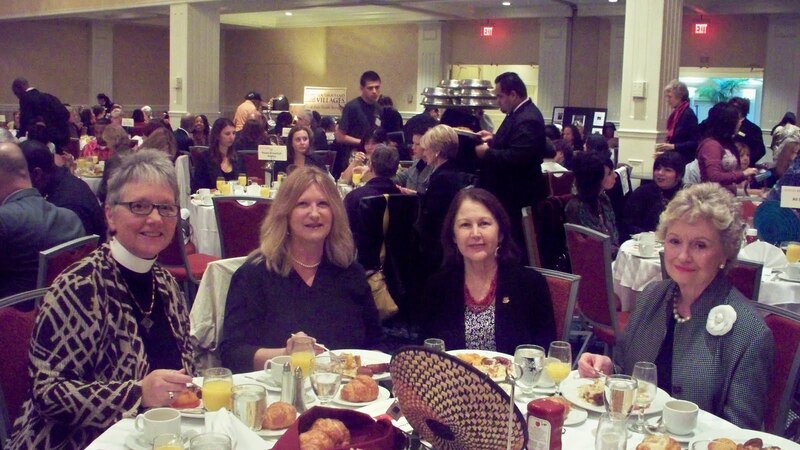 I hosted a table at the YWCA's Women for Racial Justice breakfast this morning. 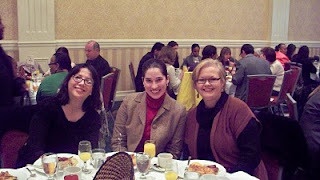 With one exception, everybody at my table was a female Pasadena blogger. Left to right on one side of the table (above): Rev. 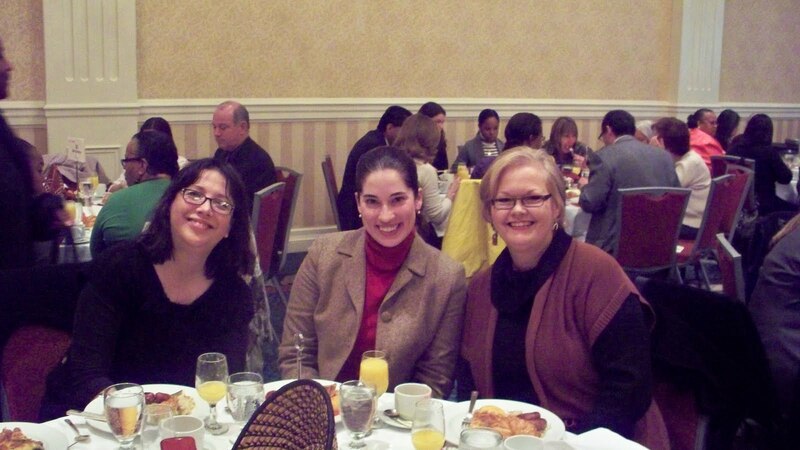 Susan Russell (Inch at a Time blog), Meredith McKenzie (Arroyo Lover blog), Thelma Reyna (Latina/o Writers Today blog), and Patt Diroll (On the Town writer, Pasadena Star-News). On the other side of the table (below), left to right, Dianne Patrizzi (Mademoiselle Grammophone blog), Gina Mendolo (Mendolonium blog) and Debbi Swanson Patrick (Altadena Above It All blog). The recipient of this year's Women for Racial Justice Award is Tony Stewart, who at the tender age of 9 picketed in her hometown of Pine Bluff, Ark., when the coloreds-only library didn't have the materials she needed for a school project and the whites-only library refused to let her in. Pine Bluff police escorted her off the premises. 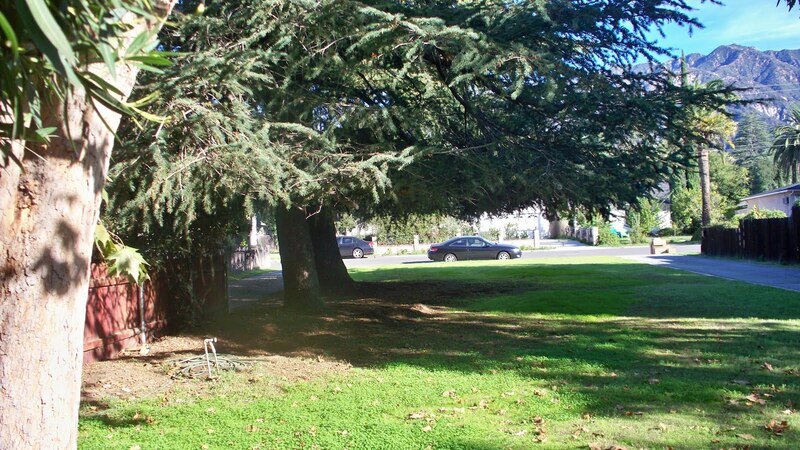 After the family moved to Pasadena in 1930, she served as secretary of the Pasadena branch of the NAACP from 1934 to 1936, chaired a committee that petitioned the national NAACP headquarters to charter an Altadena branch, and worked with the League of Women Voters to draft the charter for the Altadena Town Council. Now 93, she is president emeritus of the Altadena branch of the NAACP, which she led from 1984 to 1992. Some participants in the YWCA's Just for Girls program were at the breakfast as well; all are students at Blair and Muir high schools. The breakfast kicked off the YWCA's Week Without Violence. 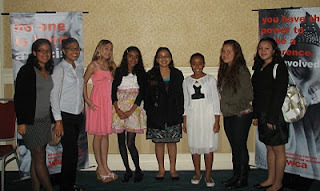 Many thanks to the YWCA Pasadena-Foothill Valley Chapter. I stumped everybody this week. The boxing photos threw many of you off. 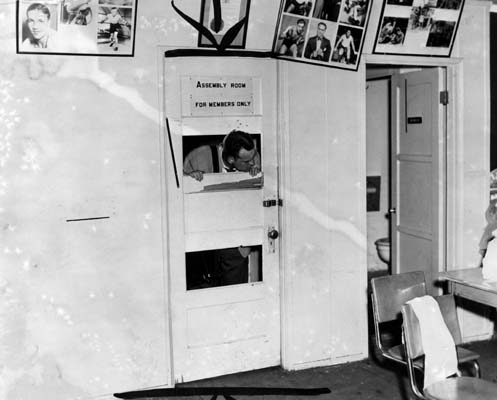 In the photo above, a Pasadena police detective peers through the broken door of the "Assembly Room for Members Only" in the back of a Chinese Restaurant at 217 S. Fair Oaks Ave. on June 8, 1950, after a raid at that location. Nearly 30 men and women were arrested after police broke through the door. Some were arrested on suspicion of bookmaking, others for conducting gambling games on the premises, and the rest for being present while the city's antigambling ordinance was being violated. Police fired shotguns in preventing the crowd from "bolting" the raid. No one was injured. Bookies, back-room gambling and vice raids...those were the days! Many thanks to Pasadena Public Library and Los Angeles Public Library. Pasadena City Councilwoman Jacque Robinson (standing) co-hosted a community budget workshop with Councilman Chris Holden last night at La Pintoresca Branch Library. City Manager Michael Beck (standing right) and several department directors discussed the current budget priorities for various departments. Andrew Green, director of finance. Jan Sanders, director of public libraries. Police Chief Phillip Sanchez with Dr. Eric Walsh (seated), director of public health. Residents weighed in on the most important budget priorities from their perspectives. More programs for youths, public safety and public health were among the comments. Then everyone filled out a short questionnaire that will be shared with council members prior to their next strategic planning workshop next month. When the official business was completed, constituents took an opportunity to chat with city staff and the facilitator to discuss any additional concerns. There's a second opportunity tonight in the cafeteria at Wilson Middle School, 300 S. Madre St. What levels of service at libraries, community centers, parks, fire stations, etc., are acceptable in light of current budget challenges? Should fewer employees be providing these services? Budget documents are here; you can also scroll down on that page to take a brief survey. 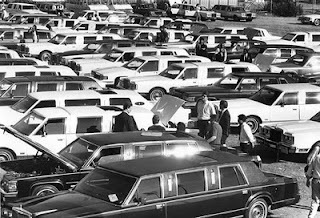 Nobody was absolutely spot on, but Paul Little was the first to come close with his 5:42 p.m. Tuesday comment "I'm guessing it's limos parked near the Rose Bowl during an event waiting for the game or show to be over." In the photo above, dozens of empty limousines are parked at Brookside Golf Course during the Super Bowl game at the Rose Bowl Stadium on Jan. 26, 1987. 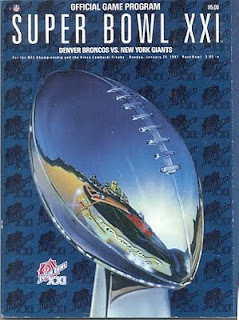 The New York Giants beat the Denver Broncos 39-20. Five Super Bowls have been played at our stadium, more than any other stadium in the nation. Now the stadium is the subject of public meetings where the financing plan for renovation and expansion is being discussed. to the Pasadena City Council for final approval this coming Monday at City Hall. That meeting will also begin at 6:30 p.m. They're public meetings, and you're welcome to attend and weigh in during public comment. The agenda for Monday's council meeting will be posted by about 6 p.m. tonight here. The council meeting will be televised live on KPAS (cable channel 3 in Pasadena) and via streaming video here (click on the KPAS icon). 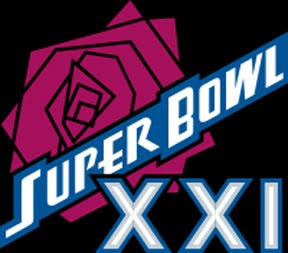 The Rose Bowl Stadium is an important historic landmark and economic resource. Is it worth saving? In this PIO's not-so-humble opinion, the answer is yes. Many thanks to the Rose Bowl Stadium and the National Football League.